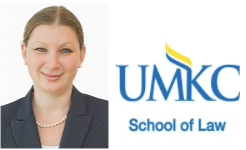 The University of Missouri – Kansas City Law Foundation awarded Mira Mdivani, Corporate Immigration Attorney with the Mdivani Law Firm, the Foundation’s 2012 PRO BONO PUBLICO AWARD. The Pro Bono award is presented every year to the alumnus who has made an outstanding contribution to the public welfare through the legal profession. The Law Foundation President Steve Cosentino presented the Pro Bono Award to Mira Mdivani.